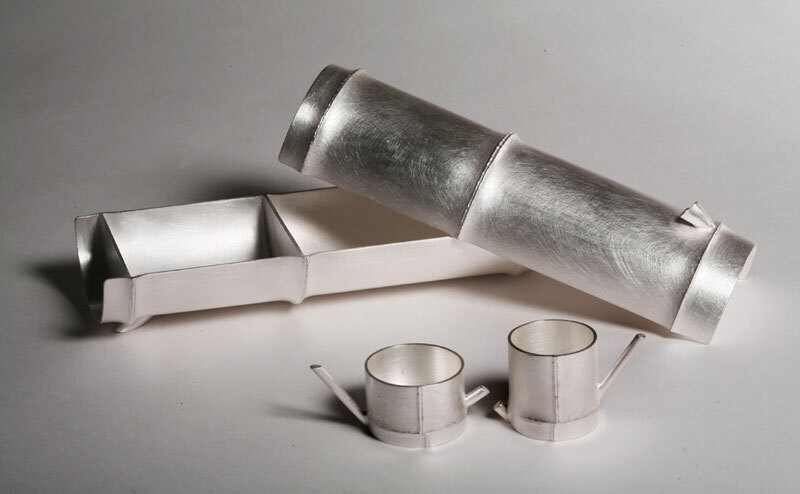 Taiwanese artist Chien-Wei Chang makes unusual and beautifully restrained silver objects – including vessels, sculptures and utensils such as ladles – all with a great sense of calm and poetry. Some fuse his Eastern culture with that of the West, while others are more hard to categorise and, as he says, ‘just show who I am’. He adds, ‘My work really depends on where I am as an individual as I just want to be honest and true to myself’. Why did you decide to come to London to study metalwork? I came over to the UK at the start of my artistic career  to study jewellery and silversmithing. At that time I was more interested in jewellery than sculpture and metalwork. I used to work at Tiffany’s in Taiwan and was interested in gemmology so I really wanted to study jewellery and learn how to make it. There were no suitable courses in Taiwan so I applied to various places in Europe and America, and London Guildhall University (now London Metropolitan University) was the first one to offer me a place. It was a bit of crazy move, to be honest, but when you’re young it’s easier to make that type of big decision than it is when you’re a bit older. What made you turn from jewellery to silversmithing and metalwork? I spent the first two years doing a lot of theory and trying to catch up on the design background. I learnt some techniques but not enough and so decided to do another course: City & Guilds - Silversmithing Large Work at the same university to really develop my skills. 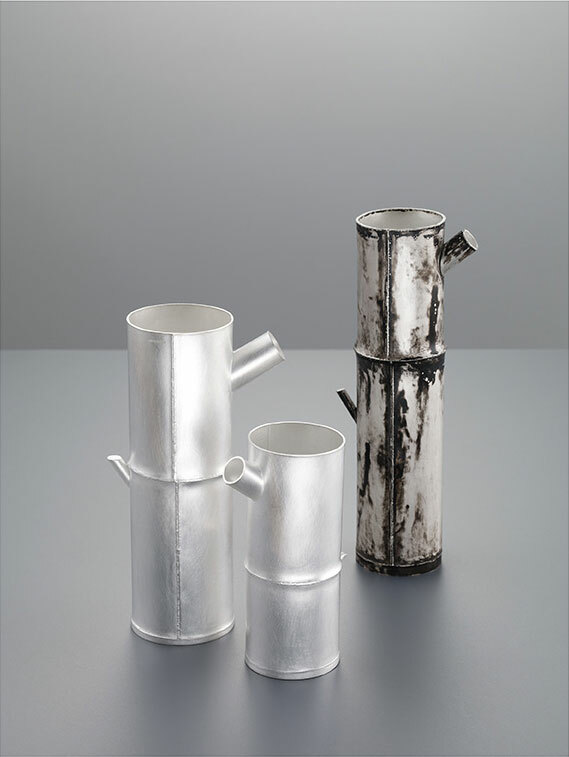 My MA tutor there was Simone Ten Hompel who is a brilliant silversmith and she showed me how to use metal to create objects rather than body adornments. When I went to her workshop, the first thing she asked me to do was cut a piece out of a chunky metal sheet. I spent hours doing it and found it very exhausting, but at the end felt that this was what I really wanted to do. Working with metal in this way is very challenging as you feel you’re involved in a physical battle with the material, but it’s very satisfying at the end and you really feel you’ve achieved something. Why do you find silver such an attractive material to work? I enjoy the process – it’s like a ritual. You start off by cutting the silver sheet and bashing it into shape and then use fire to anneal it and then hammer it and at the end put it in acid to purify it. For me, it’s a bit like a religious ritual with a spiritual element as the object is cleansed and purified. Is silver the only material you work with? No. My relationship with silver has developed, and although I still love it as it was my original passion, I try and work with different materials and different combinations. I don’t want to be labelled as just a silversmith, or for people to buy my work because of the value of the material rather than the quality of the work. I want room to grow and a bit of freedom to experiment with other materials. How do you go about creating your pieces? Sometimes I make things that I want 100% control over the outcome and so do lots of drawings and make lots of models before starting. But with some pieces I have no particular idea in my head and just wait and see how they will turn out – I just go with the flow. It’s quite an intuitive way of working as I try to listen to the voice in my heart and when I encounter any technical difficulty I just have to work through it. Do you make all your work yourself? Up till now I’ve made everything, even the wooden handles on my ladles, but now I starting to think about getting an assistant. I would love to continue to do everything but it’s not really possible and I have to be more practical. My work is now more about ideas than the process of making, so as long as I make sure that the idea is still expressed in the piece and I maintain some control over it, I think having an assistant would work. To what extent does Eastern culture feed into your work? In some cases directly and in some cases not all. 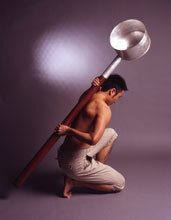 For example, with my first Ladle Series (2004) I wanted to think of an alternative functional form to the traditional Western silver spoon. The wooden ladle is a typical Oriental form, so I took that and re-worked it using materials normally associated with Western culture – rose wood and silver. 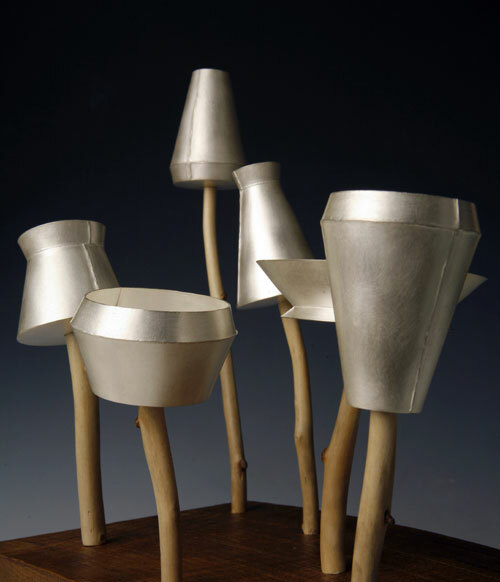 For the second series in 2006, I made the ladles using bamboo which is a very ordinary wood in the East as I liked the idea of combining this ordinary material with silver. But sometimes I’m not really consciously referring to my Chinese background – it just comes out. And now I think there are more European influences in my work. I think it’s too contrived and too pretentious to deliberately set out to do something like that – you just have to show who you are. A lot of my inspiration comes from my everyday life – people I encounter, or even very simple things like a gesture or a movement or tiny little things on the road. The ideas just keep coming and I never stop thinking about how to visualise them. Do you consider yourself a craftsman or an artist? I started as a craftsman as my original work focused on function, but now I’m more connected to the applied arts as although my work is all about materials and skill, it’s not designed to fulfil a function. It’s also no longer connected with the domestic environment, but is a narrative form telling a story. In some cases it’s quite a personal story, but some pieces try to communicate social ideas. I want to use my work as a visual document to depict my own journey from Taiwan to London and my transition from one culture to another and the fact that I recently got permanent residency in the UK. In what other ways do you think your work has developed? Winning the Shape of Things bursary [a programme designed to encourage exhibitions of specially commissioned pieces of contemporary craft funded by Arts Council England] has given me the opportunity to create a new body of work which will be more installation and sculpture than craft in terms of scale. It’s also a great opportunity to see how my work will interact with people in a public space as this show is all about the public arena and not just making a small piece for a collector to buy and put it in his house. It’s going to be really exciting working out how to exhibit in such a big space. I haven’t finalised what I’m going to actually do for the exhibition [to be held at Leicester City Gallery] as I am constantly trying to develop – I will try new things and see how far I can go each time. How did you enjoy the workshop you did for the Making in June? It was the first project that I had done with the general public and was a great opportunity for me to have direct contact with young kids and their parents. It was really challenging and really refreshing (although quite tiring!). This kind of project really brings your work alive as sharing the experience of making objects with the general public is really great. We made simple Chinese lanterns out of metal using quite simple materials and techniques but it was great fun and people were able to take home something that they could then use later on.